This is the story of a woman at a crossroads, discerning what to do and how to live after her brother’s death. A continuation of the spiritual journey she chronicled in her acclaimed book, Things Seen and Unseen: A Year Lived in Faith. Gallagher sets out to find “a new way to spend” herself. 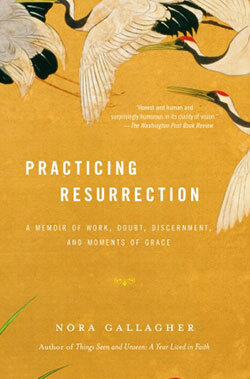 Practicing Resurrection describes the often unsettling, sometimes comic, and finally redemptive process of discovery as Gallagher discerns a possible call to the ministry, and explores her marriage, her work as a writer, and the natural world. It extends to the full meaning of life after a death as Gallagher finds that experiences of “resurrection” are not believing “six impossible things before breakfast.” The surprising end portrays a vision of ministry redefined and a marriage honestly renewed. An account of the exploration of a vocation and of new life after loss, this powerful memoir will inform and inspire anyone trying to discern the signs of a “call” to what might be a deeper purpose, and how to act on it. With a poet's ear for language and a novelist's eye for essential detail, Gallagher offers a compelling story of her journey toward "a wholeness bought at the cost of suffering." "A stunning book about faith and the writing life; what I like best is that it gradually and unexpectedly turns into a love story." "The bookstore is crowded with volumes offering instant enlightenment and painless growth. This isn't one of them. This is a true book, about faith and about doubt and about the daily things that inform a soul -- and one of the finest things I've read in a very long age." "Once again, Nora Gallagher is able bring words to the ineffable, and to make audible the language of prayer, especially the prayer that emanates from everyday life--from marriage and friendship, from work and family....a gorgeous, deeply honest, wise book." "In her beautifully written and engaging memoir Nora Gallagher shows us what it is like to live inside a mind, body, and spirit that is trying to discern the next step in the world. She invites us not only to witness her journey, but to take the rich journey that is discernment for ourselves." "Nora Gallagher is a rafiqi, a guide who can negotiate for us safe passage through treacherous and unfamiliar terrain. Her writing is honest and sober and she doesn't flinch from all that is possible in this world, neither the nightmare nor the waking vision. I am grateful for her hands at the keyboard and for her wise heart dictating." "Nora is a breath-taking writer. She is a writing and spiritual influence in my writing life. In Practicing Resurrection, Nora writes about the loss of her 'own wild life.' This is one of the best books I've ever read about finding one's way in the world. This is a book for anyone who wants to find the juice again."